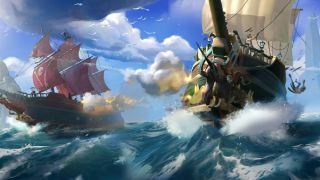 Sea of Thieves launches March 20 and, while it’s an Xbox One console exclusive, you can also run it on practically any Windows 10 PC you’d like. Whether you have MacBook Pro or even a simple basic budget laptop for college, you can run the game on just integrated graphics. All you need at the very least is a 5th-generation Intel Broadwell CPU with Intel Iris Pro Graphics 6200 or better. Bear in mind that you won’t have the most luxurious experience playing on integrated graphics, as Rare says players can expect to achieve 30 frames per second (fps) while playing at a 540p resolution with this hardware. Luckily, the HD gaming experience of 720p and 30 fps is only a stone’s throw away at a minimum of an Nvidia GTX 1030 or AMD Radeon R7 450 desktop GPU. In terms of mobile graphics, you should be able to achieve the same level of performance with a Nvidia GeForce MX150-powered laptop, like the Acer Aspire 5. For Full HD (1080p at 30 fps) gaming, Rare suggests, at the very least, an Nvidia GTX 1050 Ti or AMD Radeon RX 460 on desktops. On the laptops side, you could easily run the game using machines such as the Dell XPS 15 or Lenovo Legion Y520. From there, Rare has shared a full breakdown of what system configuration you’ll need to run its swashbuckling sandbox adventure at higher resolutions and frame rates. The best thing about picking up Sea of Thieves on the PC is the fact that it’s an Xbox Play Anywhere game, so your copy will work on both your gaming PC and an Xbox One complete with cloud saves shared between both platforms.